The Tux chair is our contemporary interpretation of the Classic Chesterfield. The deep buttoning and tailored detailing make this piece a personal favourite. Shown here upholstered in Altfield Aria mohair velvet, with legs in natural oiled walnut and upholstery nails* in polished nickel. Construction: Solid seasoned beech frame with a sprung seat and webbed back, both deep buttoned. For this piece we have used Altfield Aria for their wonderful mohair velvet. Each Stuart Scott piece is built by hand in our workshop in Wiltshire, England. Nothing is mass-produced. This ensures complete attention to detail, structural integrity and sheer build quality. We never compromise. When we finish each piece, it is signed and numbered: a unique handmade masterpiece. Midcentury wood frame chair newly updated in pearl gray silk velvet. Beautiful and comfortable side chair for any room in the house. 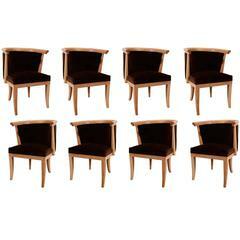 Eight neoclassical barrel chairs by ROmwebber. The finish is a lightly limed oak with velvet upholstery.